Be on the lookout for Yeti in New York City! 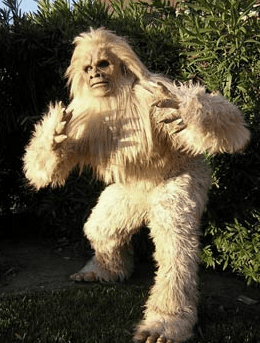 Swarms of yeti (otherwise known as Abominable Snowmen) will be taking over NYC on Tuesday, October 4th, as part of a promotion for Travel Channel’s new special, Expedition Unknown: Hunt for the Yeti. The yeti will arrive on a double-decker bus at 10:30 am at Flatiron Pedestrian Plaza on Tuesday morning before moving through the city. Ice sculptures will be created around the city to commemorate the event, and free iced coffee will be provided to spectators (at 36th St. and 7th Ave. in the morning, and at Union Square in the afternoon). Expedition Unknown: Hunt for the Yeti. starring Josh Gates, premieres the first of four episodes beginning Wednesday, October 5th, on the Travel Channel. Do you plan to hunt for Yeti in New York City? Join the conversation on the FoCC forum!